Select the option of your choice. Further, if you are interested in purchasing a lunch plan, add the lunch option of your choice. If you have any questions about registrations please email us at WayneDanceStudio@gmail.com. Registration fee for new season is 35.00 2nd child 30.00 and 3rd child 25.00 We Look Forward to Seeing You in the Spotlight! TEarly Registration discounts may be used one time during the registration period. As the legal parent or guardian, I release and hold harmless Heather Wayne's Performing Arts, its owners and operators from any and all liability, claims, demands, and causes of action whatsoever, arising out of or related to any loss, damage, or injury, including death, that may be sustained by the participant and/or the undersigned, while in or upon the premises or any premises under the control and supervision of Heather Wayne's Performing Arts, its owners, contractors, employees and operators or in route to or from any of said premises. The undersigned gives permission to Heather Wayne's Performing Arts, its owners and operators, and staff to drive the Heather Wayne transportation bus/car/van. I release and hold harmless Heather Wayne's Performing Arts, its owners and operators from any and all liability, claims, demands, and causes of action whatsoever, arising out of or related to any loss, damage, or injury, including death, that may be sustained by the participant and/or the undersigned, while in or upon the premises or any premises under the control and supervision of Heather Wayne's Performing Arts, its owners and operators or in route to or from any of said premises. I Authorize Heather Wayne's Performing Arts (also abbreviated as HWPA), its owners and operators to seek medical treatment for the participant in the event they are not able to reach a parent or guardian. I hereby declare any physical/mental problems, restrictions, or condition and/or declare the participant to be in good physical and mental health. I will give a copy of our Insurance Card at registration for emergency medial treatment only. I authorize Heather Wayne Performing Arts (also abbreviated as HWPA) to release the participant to individuals named on the Emergency Contact/Pick Up Form. I understand at the beginning of participation, I will be given "Pick Up Cards" for the participant and will ensure they are distributed to individuals authorized to pick up the participant. Further, I understand the participant will not be released to any individual not possessing a "Pick Up Card" without providing identification and authorized for pick up as indicated on the Emergency Contact/Pick Up Form. SUMMER CAMP- each camper will have a pick up card for that particular camp. I understand I am responsible for completing this form prior to the beginning of the participant entry into Heather Wayne Performing Arts Further, I am responsible for ensuring the Emergency Contact/Pick Up Form is updated. I authorize Heather Wayne Performing Arts (also abbreviated as HWPA), request transportation coordinated Heather Wayne Performing Arts to transport the participant. I fully understand that traveling by bus involves risks and dangers; these risks and dangers may be caused by my own actions or inactions, the actions and inactions of other drivers or passengers; there may be other risks and social and economic losses either not known to me or not readily foreseeable at this time. I FULLY ACCEPT AND ASSUME ALL SUCH RISKS AND RESPONSIBILITY FOR LOSSES, COSTS, AND DAMAGES incurred by the participant and/or minor child as a result of the utilization of the transportation service. 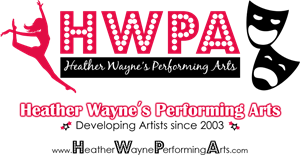 I authorize Heather Wayne Performing Arts (also abbreviated as HWPA) to publish the photographs taken of students and/or the undersigned minor children, and their names, for use in the HWPA website, social media and for display in the facility. I release HWPA from any expectation of confidentiality for the minor children and myself and attest that I am the parent or legal guardian of the children listed in this registration. I have the authority to authorize HWPA to use their photographs and names. I acknowledge that since participation in publications and websites produced by HWPA is voluntary, neither the minor children nor I will receive financial compensation. I further agree that participation in any publication and website produced by HWPA confers no rights of ownership whatsoever. I release HWPA its contractors and its employees from liability for any claims by me or any third party in connection with participation or the participation of the undersigned minor children. I give HWPA permission to use my child(s) picture for the purpose of advertising on the studio website and/or informational brochures. If for any reason I do not feel comfortable with this, a written notice to the school will ensure my child's picture not to be used for any reason.